A packed service saw the inauguration of The Spire Church on Sunday 2 September. The service, led by The Spire Church ministers, Revd. Michael Hopkins and Revd. Conrad Hicks. The church also welcomed Revd. 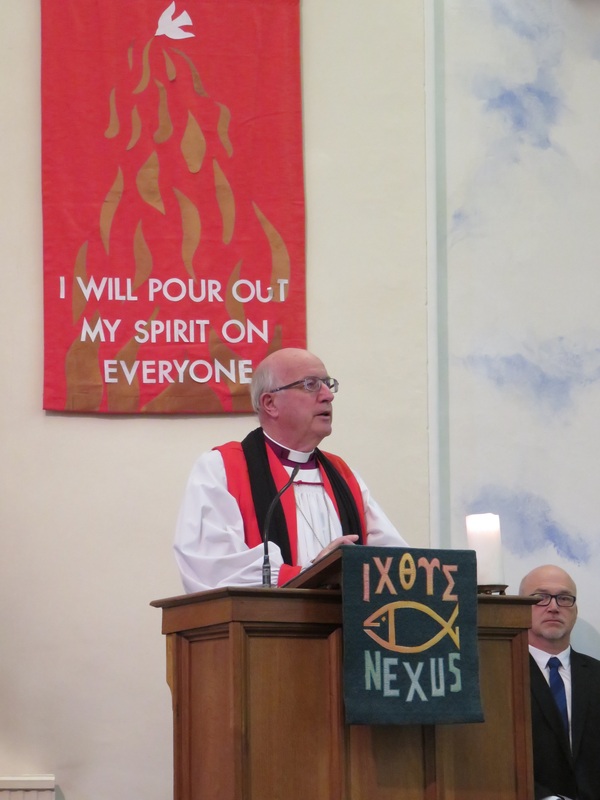 Dr. Chris Blake, Superintendent Minister of the Hants-Surrey Border Methodist Circuit, Revd. John Hellyer, Chair of the South East Methodist District, Revd. Ray Stanyon, Development and Support Officer of the Wessex Synod of the United Reformed Church, and representing the Synod Moderator, Mr Alan Yates, immediate past Moderator of the General Assembly of the United Reformed Church, and Cllr. David Attfield, Farnham Town Mayor. During the service, the church’s constitution was formally adopted and signed, the Church Leaders elected and commissioned, the ministers affirmed, the congregation made a covenant with each other and with individually with God, and keys to the two buildings were exchanged. The congregation then shared Holy Communion together. Listen to a recording of the service here.